Sobhi’s ascension through the ranks of the Third Field Army follows a typical career progression, serving in administrative positions and as executive officer before taking command of the army. His promotion to chief of staff of the armed forces and vice-chairman of SCAF came as the most senior military officials were forced to retire by then-President Muhammad Morsi, but both Sobhi and General Abdel Fattah al-Sisi—promoted to defense minister and chairman of SCAF at the same time—held sufficiently prestigious titles that their ascension did not upset the military as a whole. When Sisi resigned his commission and portfolios in order to run for the presidency in March 2014, Sobhi was the logical choice to replace him. Sobhi was replaced as defense minister in June 2018 in a cabinet shakeup at the start of Sisi’s second term, and moved into semiretirement as a presidential adviser for defense. During Sobhi’s time as commander of the Third Field Army, South Sinai—the Third Army’s area of operations—was significantly quieter than North Sinai, where the Second Field Army operates. 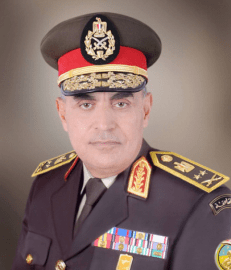 Sobhi, like other military leaders, stressed the relationship between the army and the people of Suez and Sinai, and the Third Army undertook a number of “national service projects”. Relations with Bedouin, however, were not always smooth: Locals complained about exclusion from opportunities in the military and development issues. A handful of violent incidents did occur, including a raid on a police station and a string of kidnappings in 2012, but many of these were attributed to local concerns and actors rather than organized groups of terrorists or insurgents. Since his promotion to chief of staff and then commander-in-chief of the armed forces, Sobhi undoubtedly played a role in formulating national strategy in the counterterror campaign; however, little information is available tying him to specific events.